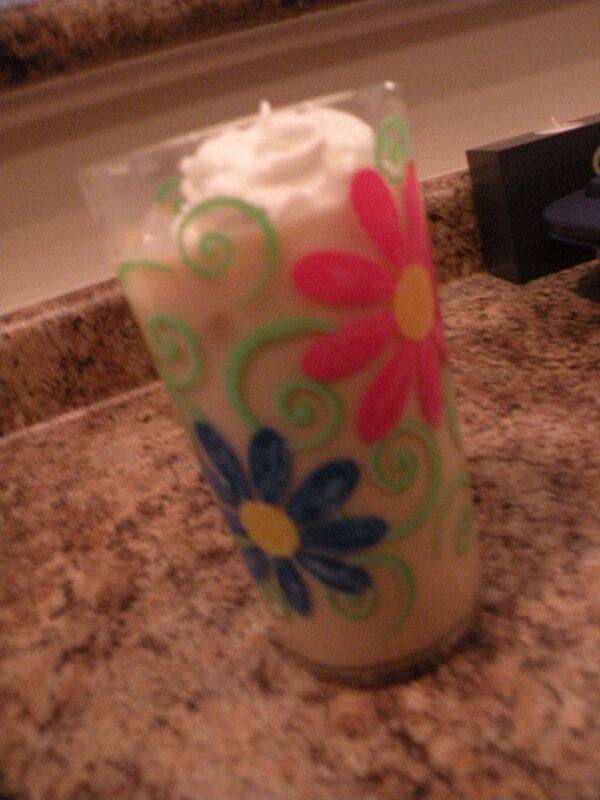 next to baking, i think that creating new drinks is one of my favorite ways to express myself in the kitchen. if i could get past working nights and weekends, i’d probably open my own coffee shop. anyways, i LOVE iced coffee, well coffee loaded with cream and sugary goodness. for now, i love being a barista at home. it saves money and calories, too! here are some variations that i typically make. we do not have a coffee maker. tom despises the smell and taste of coffee and i only drink one cup at a time. thank goodness for folgers classic roast coffee singles! i can brew a quick cup of coffee in about 4 min. i like to concentrate my coffee base, so i typically use 2/3 c water and one single. i microwave it in a pyrex glass measuring cup for 2 min. and 3o sec. and let it sit for a few more minutes after that. once your base is complete, you’re ready to begin! here are a few of my favorite varieties of drinks. while the coffee base is still in the pyrex, remove the coffee bag, stir in 2 tbsp caramel and splenda. pour mixture over a 16 oz. glass full of ice. add creamer so the glass is 2/3 of the way full, stir. fill to the top with milk, stir. while the coffee base is still in the pyrex, remove the coffee bag, stir in 2 tbsp chocolate syrup. * mochas can be dressed up in many different ways.